Firstly, if there is a leak currently going on in your home, call us immediately at (904) 574-5100! Once you’ve called your emergency water damage restoration service, you can begin to save the parts of your home. How to respond to emergency water damage! Can you Stop the Leak? If not, can you stop the source of water? If not, do as best as you can to stop the leak and the incoming amount of water. Once the water is stopped or slowed identify the affected materials and map the perimeter of affect. Find the farthest part affected by water and add an additional 5 feet in case the water comes from below. Categorize the contamination from the water source. What fixture is the water coming from. What direction is the water flowing from? Assess the value of all the above statements and determine what you want restored or replaced. If the leak is ongoing, we will try our hardest to stop the leak and possible change the piping if necessary. After the emergency has been taken care of, we will take your itemized list and give you a readout for the cost of expenses and determine where to move forward regarding restoration. Dehumidifiers – Reduces humidity which increases the rate of drying. 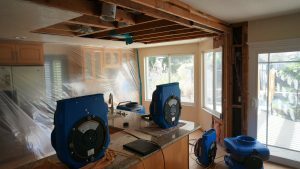 Air Movers – Increases rate of evaporation, increases the rate of drying. Air Scrubbers – Portable filtration systems that draw in air and pass it through filters, improving indoor air quality. We provide the best water damage restoration in Jacksonville. We are a 24-hour company which means that whenever you have a problem in your home, call us at (904) 574-5100 and we will be to your location in under thirty minutes to help you with whatever problem is affecting you!